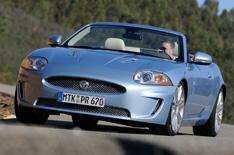 Jaguar XF and XK ranges | What Car? Europe gets its first look at Jaguar's revised XF and XK ranges at the Geneva show. The glamour models are the high-performance XFR and XKR, first shown at Detroit in January. The most significant for European buyers are the new diesels making their world debut. The old 2.7-litre V6 is being replaced by two 3.0-litre engines that deliver significantly more power and torque while making substantial reductions in fuel consumption and CO2 emissions. The new diesels giving 237bhp in standard form and 272bhp with 'S' tune will first appear in the XF later this month, with prices starting at the same point as before. Expect to see them next in a new XJ limousine towards the end of 2009. Elsewhere on the stand there are XF and XK models with new 5.0-litre V8 engines in place of the old 4.2-litre units. In supercharged form the 5.0 delivers 505bhp almost 100bhp up on the 4.2 for the new XFR and revised XKR. There are similar gains from the normally-aspirated unit, which puts out 382bhp against the 295bhp of its predecessor. It will be available in both XF and XK ranges. The XK gets new electronic chassis and transmission control systems, as well as interior and exterior styling changes that bring it closer into line with the XF. Prices for the new XF V8 start around 5300 higher than before, with the XFR coming in at 59,900. There are more modest increases of up to 3500 on the XK range.